TriMet will help you get your groove on and celebrate our nation’s birthday at the 2016 Waterfront Blues Fest. 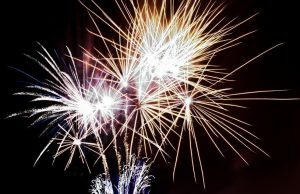 The festival kicks off Friday, July 1 at Tom McCall Waterfront Park and culminates with a fireworks spectacular on the Monday, the Fourth of July. Large crowds are expected, especially for the fireworks and Tilikum Crossing, Bridge of The People, will provide great views of the display. Please stay alert around buses, trains and streetcars. Also, the multiuse paths on Tilikum Crossing have marked pedestrian and bike lanes so please be aware and do not block cyclists. All MAX lines serve the Portland City Center as do several bus lines, but be sure to plan your trip before you go because bus schedules will be adjusted for the holiday. MAX and the Portland Streetcar will operate on regular Saturday schedules. Buses will run on Sunday schedules. Holiday schedules are posted at trimet.org/schedules/holidays. TriMet’s Downtown Ticket office, our Lost & Found office and 503-238-RIDE call center will be closed Monday. TriMet will add extra buses and MAX trains from about 9 p.m. until the end of service as needed for the Fourth of July fireworks show. Vehicles may be crowded so be sure to plan extra time, and if you bring a big stroller or large cooler on board, you’ll likely have a longer wait as everyone heads out of downtown after the show. The Hawthorne Bridge will close and four TriMet bus lines – 4, 6, 14 and 15– will be detoured to the Burnside Bridge from about 9 p.m. through 11 p.m., leading to delays. Plan extra time if riding those lines and check trimet.org/alerts before you go. On Tilikum Crossing and near the waterfront, TriMet reminds pedestrians and cyclists to be visible, alert and safe. Take out your ear buds and put away your phone or other distractions when crossing streets or train tracks, only cross at designated crossings and obey signals, and always look both ways. In most areas, trains, buses and cars travel both directions. Fares are required on all TriMet vehicles and the TriMet Tickets mobile app makes paying your fare easy and convenient. Just download the free app for your Android or iPhone and you can buy fares for you and your family anytime, anywhere. There’s no need to keep track of paper tickets; they’re stored in your phone. Learn how easy it is at trimet.org/app. TriMet’s online trip planner makes it easy to plan a trip, with information on travel and walk times, transfers and cost. Visit trimet.org.